But with the help of $30 and some brown paper bags from the grocery store, I got to make the cutest, UMass inspired, wall hanging. I cleared off my desk, unfolded the brown paper bag, and laid it out on the top of my desk. 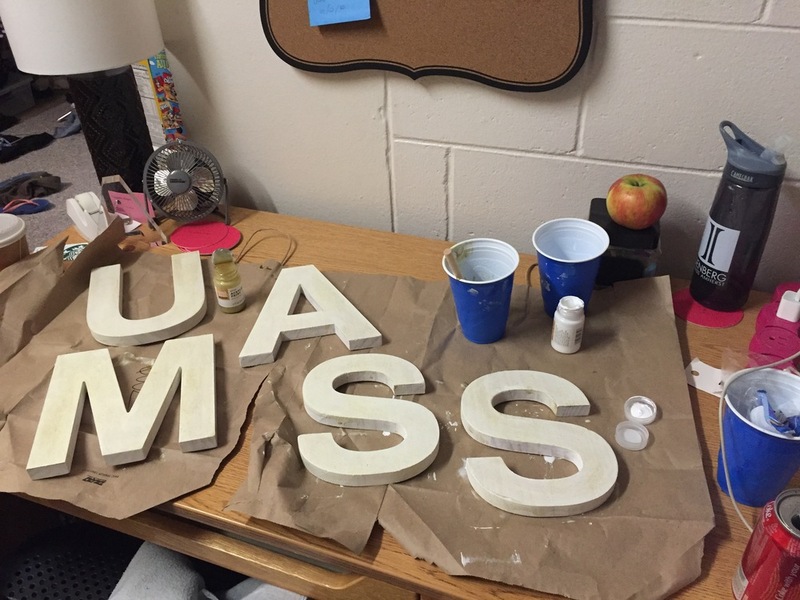 I painted two coats of the white paint onto each of the front sides of the letters. I suggest not painting the backs of any crafts for your dorm because if the paint scratches your dorm wall you could get charged for it. While the top coat was still slightly wet I painted the top glitter coat. You can't see the glitter visibly until light shines on them. During the day when the sun hits the letters they sparkle; and at night when I have my strung lights on they glow. And the white backdrop makes them fit perfectly into my minimalistic, chic, dorm. Have you done any Dorm DIYs lately?